Orange France had a phone slip, and left no secret unturned when it comes to HTC's upcoming One A9, which will mark a brand new A-series of svelte midrangers for the company. The One A9 is listed with a 5" 1080p display, a 13 MP rear camera, and a 4 MP front-facing snapper, likely of HTC's notorious UltraPixel variety. The phone is issued with Android 6.0 Marshmallow out of the box. As for the processing power inside, the Snapdragon 617 chipset and 2 GB of RAM hint that HTC is placing its new A-series squarely in the upper midrange category, and it's the design that sets those apart, as well as the price tag. 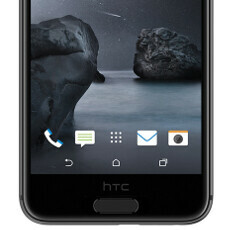 In terms of design, HTC delivers, as you can see in the high-res photos of the black and grey A9 below. When it comes to price, Orange tagged the phone at €599.90, though this is most likely a placeholder until the phone goes official, as at these specs such a flagship-worthy price would be hard to swallow. In any case, October 20th is not far away, and we will know for sure what HTC has in store for us then. The A9's appearance on the Orange France's website at least confirms that this won't be an Asia-exclusive phone, as so many of the best HTC handsets these days. Looks like an iPhone with an android launcher.Even Priced like one. And this is how you destroy a mobile company. RIP HTC you had a good run. It has gone to this because people didn't appreciate the previous HTC phones enough, they'd rather go Samsung or Apple. So their brilliant strategy is to develop and underwhelming phone for a flagship price? Underwhelming? It's true that their cameras were underwhelming, but other than that their phones are excellent, try using one as a daily driver before calling them underwhelming. It smells like a GS4: display 5"/1080p, ram 2GB, camera 13mp, only cpu/gpu difference is 600 to 617. And the price tag? Correction It Looks Like An HTC Phone. Cause You The iPhone 6 Is Just Apple's Version Of The One M7. HTC Has Internally Lost Its Mind, Cause Like You Said It Is Priced Like An iPhone And The A9 Isn't A Flagship Device. 100% agree. What the F is happening?? HTC is a great company with a great history. In 2015 this company has been destroyed more than what E-flop did to Nokia. Investigations must start in this company. Yes! Now it is white. Nah I Don't Think That's Glass Above The Home Button. They Really Did Get Rid Of The Black Glass Bar, Even Though They Just Changed It To Metal And Put A Home Button Where The Front Facing Speakers Use To Be. True, And If Its Just A Scanner They Should Have Put It On The Back And Shrieked The Bottom Bezel, Poor Design Choice IMO. It seems Peter Chou never wanted to ape the popular designs from other successful brands. That's why the chair women took over the reigns from him. She has decided that blind copy of iphone is going to bring in success. But I feel with the launch of this A9 model, HTC's reputation will be damaged very badly. Since these people have spend so much time of the year to design and release A9, don't expect One M10 to be any different as only a few months are left to get the falgship ready. RIP HTC. Agree with you that both were committing suicide, but HTC does not have the billions of Nokia or the huge network infrastructure or HERE, and the company value is less than $1.5 billion. Is this the new hero flagship phone HTC reps said was coming before the year end? Does anyone else think this isn't flagship level at all? (and the price is outrageous) I need to know I'm not bugging out, is it just me or not? With that design, UI, specs and price it could be successful as a mid 2013 flagship. Now it's a harbinger of massive Q4 2015 losses, probably is a death sentence. i really follow any news regarding this particular phone, just because, im hoping that one day, there will be an article explained that this is not the real design, it's a joke etc. because, c'mon htc, this one really looks like iP6's design. seriously? !